Place cream cheese in freezer until firm but not solid, about 25 minutes. Heat oven to 350°F. In large bowl, break up cookie dough. Stir or knead in flour and lemon peel until well blended. Cut firm cream cheese into 72 (1/4-inch) cubes. Shape level measuring tablespoonful of dough into ball. Make 3 indentations with end of wooden spoon. Fill each indentation with 1 cube cream cheese. Wrap dough around cream cheese to completely enclose, and shape into ball. Place on ungreased cookie sheet. Press 4 or 5 blueberries into each ball of dough. Bake 10 to 14 minutes or until edges are light golden brown. Cool 5 minutes; remove from cookie sheet to cooling rack. Cool completely. Sprinkle with powdered sugar. Freezing the cream cheese makes it easier to cut into tiny pieces and place in the dough. 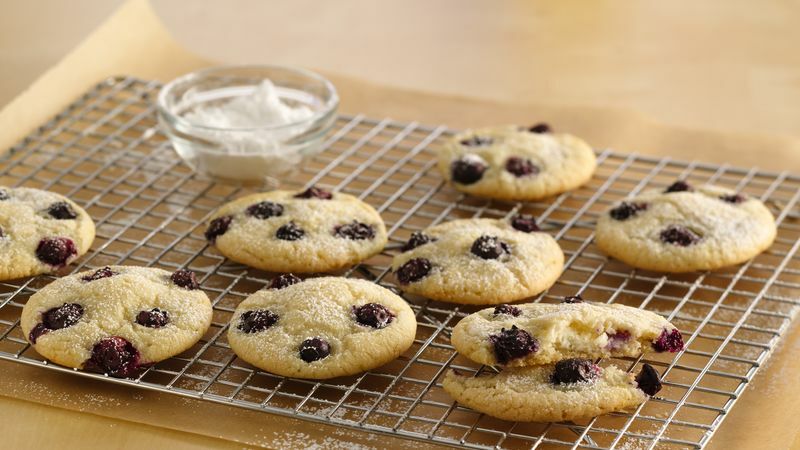 Fresh blueberries are best in this recipe but frozen blueberries can be used in a pinch.